Neal J. Manor, born in Radford, Virginia, on November 11, 1985; admitted to bar 2013, Kentucky. Neal obtained a B.A. in Political Science from Duke University in 2008 and his J.D. from the University of Kentucky College of Law in 2013. 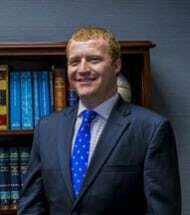 He is a member of the Fayette County and Kentucky Bar Association. His areas of practice include insurance defense, first party insurance claims and personal injury defense.